Mahaila Houle’s first dream job was to be a ballerina. Granted this was when she was four years old. Since then, she’s changed a bit. Houle, 23, went from future ballerina, to being a tomboy, to going to college for art, then psychology, and then on to motorcycle engineering. 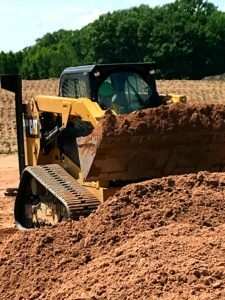 With each experience, she’s learned more about herself, and over time, she discovered an interest in operating heavy equipment, such as bulldozers and excavating machines. What connects Houle’s many interests is her curiosity about how things work. “I was always really good at art, but my true interest lied in how things work. I’ve always liked learning about the mechanics of cars and machines, and also how the brain works. That’s what led me to majoring in psychology in college,” says Houle. Houle just kept trying new things until she found her niche. “I think everyone has an idea about what they really want to do when they grow up… it’s just that you don’t really know until you are grown up and you have the opportunity to actually try some of the things that you’re curious about,” she says. In a way, Houle feels like her subconscious was manipulated by the “cookie cutter” ideas thrown at her and other students about going to college after high school, getting a good job, and starting a family. “Everyone (especially her teachers at Carlton High School) said, ‘you’re good at art, you should go to college and get a degree in art,’” she says. After taking her teachers advice, and then soon realizing she absolutely hated art school, Mahaila decided to learn about psychology. Once graduated with a degree in psychology from Fond du Lac Tribal and Community College (FDLTCC), Houle was on the job hunt. It was then that she began thinking about a job in a trade. That interest in working on machines almost led Houle to move to Florida to enroll in a motorcycle mechanics program. Instead, she learned about a pre-training program for members of the Chippewa Tribe to learn how to operate heavy equipment through the International Union of Operating Engineers (IUOE), Local 49. As a member of the Fond Du Lac Band of Lake Superior Chippewa, Houle jumped on the opportunity and applied for a training program offered once a year to learn to become a heavy equipment operator through the TERO office at Fond Du Lac. [Note: More information about TERO is located at the end of this article]. “During the TERO training program, there were 20 members of various tribal bands in my class. This went down to 10, and then only five graduated. To succeed it was important to have attention to detail, show up to class, and pass an assessment test,” Houle says. According to Houle, the TERO job-training program gave her a leg up on learning about the construction industry. She learned about OSHA safety rules, the IUOE, and many other aspects of the construction industry. After completing the TERO program, each graduate needs to be hired by an approved contractor to be accepted in the Local 49’s four-year apprenticeship program. And initiative is something that Houle is definitely not lacking in. On the reservation, Houle heard of a job that required a heavy equipment operator. Even though they had already hired someone, Houle decided to be there anyway in case the other operator didn’t show. Houle arrived at the site before anyone else that day and waited. Sure enough, the other operator didn’t show. The site manager asked her if she could operate the machines, and hired her on the spot for the job. “You have to take initiative to get what you want. And be good at it,” says Houle. Houle impressed the site manager with her skills and her willingness to learn. As a result, she was accepted into the Local 49’s apprenticeship program. While she continues to work, Houle takes classes on a regular basis to learn about how to operate new machinery. 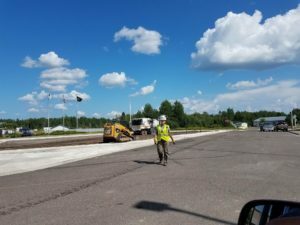 During the winter months, when the company is not operating at full capacity, Houle takes more classes through the Local 49’s training center near Hinckley, Minnesota. To Houle, the key to learning is asking lots of questions. “What really helps me to learn is not being afraid to open my mouth. I ask a lot of questions all the time and I learn a ton because of it,” she says. As a first-year apprentice, Houle has successfully adapted to her new career because she knows how important her job is and the importance of safety in performing it. Along with safety, a sense of security is huge for Houle. The Local 49 not only gives members the opportunity to be paid very, very well, there’s also security in the benefits offered. The Local 49 is dedicated to developing their members and giving them tools to succeed and enhance future career opportunities. “Being in a union, I know I’m protected in so many ways, and I’m really grateful to have found such a great community to be a part of,” says Houle. While Houle’s journey has had lots of twists and turns already, she’s learned that by being persistent, you can find a career that matters to you. When thinking back to high school and her decisions for the future, Houle explains she never was informed about the option of going into the construction trades. That being said, she has no regrets for all the different career pathways she’s tried out. 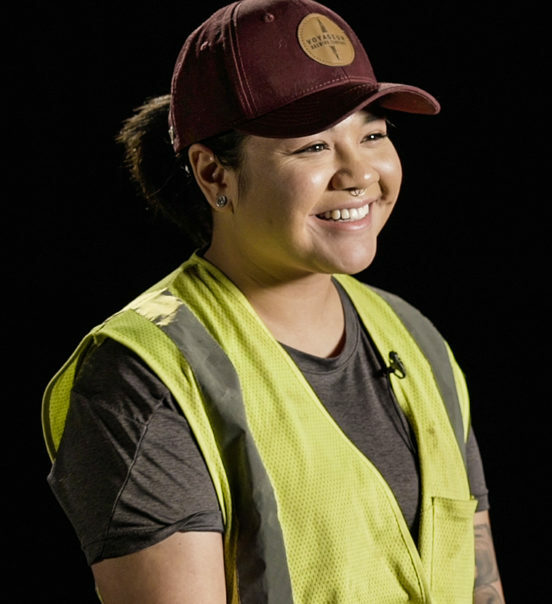 Now that Houle has found her dream job, she’s growing her roots in Cloquet, Minn. and building her dream home – an incredible feat for anyone looking for their lifelong career, let alone a 23-year-old. To learn more about construction apprenticeship opportunities, visit ConstructionCareers.org. To learn more about the International Union of Operating Engineers (IUOE) Local 49, visit Local49.org. More about TERO: TERO stands for Tribal Employment Rights Office. A number of tribes/bands in the Great Lakes region offer TERO programs, including the Red Lake Band, Bois Forte Band of Chippewa, the Fond du Lac Band of Lake Superior Chippewa, the Ho-Chunk Nation, the Keweenah Indian Tribe, Grand Portage Band of Chippewa, the Leech Lake Band of Ojibwe, the Mille Lacs Band of Ojibwe, the Oneida Tribe, the Stockbridge Munsee Community and the White Earth Band of Ojibwe. The first priority of TERO is to enforce the TERO Ordinance on or near each reservation by protecting Native American “preferential” employment and contracting, improving wages, training careers and contracting, and assisting businesses to achieve TERO compliance. TERO’s Job Skills Bank offers opportunities to learn landscaping, roofing, drywall, painting, plumbing, electrical, carpentry, welding, heavy equipment operation, road construction, security and labor both skilled and unskilled.